Megan Gates is an active blogger who provides written work to the blogosphere pertaining to New York Real Estate, Nassau Rentals, home improvement and the latest architecture, design and fashion. Follow her on twitter @MEGatesDesign. If your daughter is a cheerleader, the odds are high that she is obsessed with it. A lot of young girls dream about being cheerleaders when they grow up. When they actually get into junior high and high school, they are dedicated to this dream. They can even take it on to college if they work hard enough, so you would do well to promote your daughter's obsession in any way that you can. This may mean decorating her room to match her chosen pastime. Below are a few different ideas for things that you can do to really make her bedroom a special place. Many cheerleaders are involved in competitions. They can get medals when they win over other teams of cheerleaders from other schools. If your daughter has been in some of these competitions and she has won them, you can make a shelf for her medals. A good idea is to make the top of the shelf flat and empty; you can use it to set up plaques and similar rewas. Below that, you can put some pegs where her medals can hang on their bands. 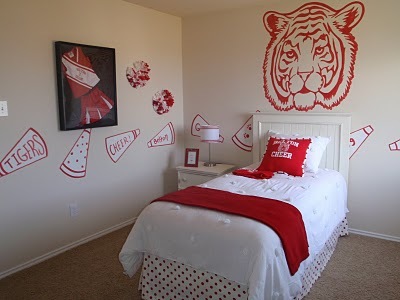 Your daughter probably has a lot of school spirit if she wants to dress up and cheer for them all of the time, so you can paint the room with the same colors. You can just use the main color - blue, for instance - for the walls. You can then use the secondary color - white or yellow, for example - for the trim. If you want a less intense look, you could just paint the walls white and then put strips of blue and yellow around the top. You could also paint the trim these colors. When your daughter has been in competitions or led the cheers at games, she has probably been photographed for the local newspaper. You should take these photographs and frame them. There are also team pictures and individual pictures taken at most schools. You can frame these as well. You may even want to get a large frame that can accommodate many pictures. You can then put them all in the same place so that she has a nice collage of her and her team. Lastly, you may want to create a place where she can hang her cheerleading outfit. This could be as simple as putting a hanger on the wall. It could be more complex, though, if you want to transfer a small closet into a place where the uniform can be displayed. You could even do this in conjunction with the pictures so that she can have everything in one place. By setting her cheerleading outfit aside from all of her other clothes, you will be showing her that you support her in all that she does and that you also think that her pastime is important. Take a look at this cabinet! 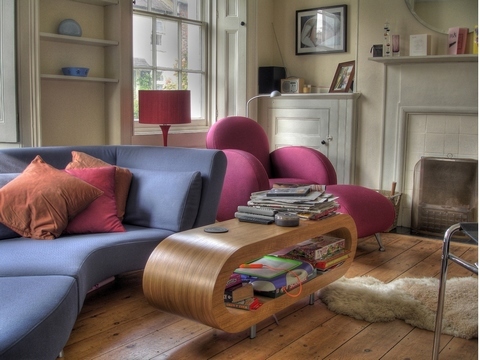 This interior grabs attention because of the way it blends disparate styles. 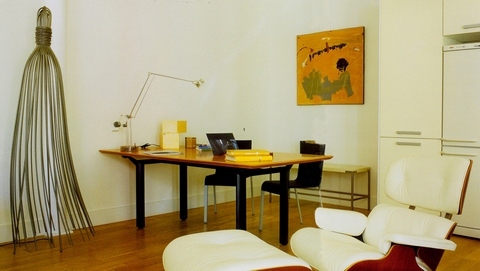 These primitive style decorations make a perfect addition to this modern minimalistic interior, don't they? This cozy feeling is created by the fireplace, the furry "bearskin" carpet, as well as the pail of magazines and overall warmness of all the colors. Isn't it the place where you'd like to be on a long winter evening? Indeed it is.